Lovely day for couching it after a nice long walk with the dog and baby girl. Football game anticipation is one of two things on my mind, I am also hungry. Not hungry enough to get up. Turns out I’m also lazy. The phone rings. He is a little upset (he’s actually freaking out) and he has rats in his grill. I tell him not to worry too much, that type of thing happens this time of year. He doesn’t agree. This was the beginning of my Saturday afternoon. I shouldn’t laugh, but it was kind of funny. I actually get this story a lot over the winter months. The cold weather makes rodent activity around our homes spike. Doesn’t matter what type of rodent, they need protection from the elements. They will look for this protection anywhere. Believe it or not, your grill is the perfect spot to hide out and stay out of some weather. Your attic is also a great place. It’s nice and warm and protects you from the rain. So for rodent control Austin customers can appreciate here are some things you may want to consider. Rodents, or in this case rats are looking for three things, food, water, and shelter. 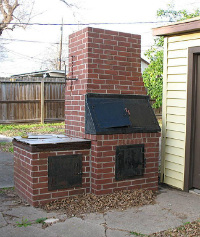 Think about it, a bar-b-que grill is the perfect little spot to hang out and weather a storm or a cold night. You may have a little left over food. There are always some bits and pieces stuck to the grill, or maybe even some drippings around in there somewhere. The pit or smoker is the perfect little shelter. Rats can feel safe and secure in the heavy undisturbed metal cave. Hopefully water isn’t far off from their new home. These areas that could provide shelter are important for rodent control Austin customers are looking for. We do rodent removal and rodent extermination for a living. . You can do rodent extermination, rodent removal or both depending on the type of rodent you are dealing with. Generally speaking when dealing with rats rodent extermination is a much more attractive option than rodent removal. What our Austin rodent control customers want to know is how on earth these situations can be avoided. That request can be a bit difficult but to take the first step towards avoiding these jobs all together you must be aware of the surroundings that will attract rodents. Think about food water and shelter. Food. Do you have bird feeders all over the place? Does your grill need a thorough clean out? Do you have dog and cat food out in a bowl on the back porch year round? All these things attract rodents to your home. They also convince said rodents to set up shop nearby. They know there will always be a good and dependable food source nearby. Water. A water source is always top on the list, especially in Central Texas during the summer months. Does your home have leaking hose bibs? You probably have three or four hose bibs around your home. Might be worth your time to go check them and make sure there isn’t a steady drip coming out of any of them. How many bird bathes are in your back yard? Do you live near a creek? All of these elements are going to attract rodents. It is a good idea to attempt to address any issues you are able to change and be mindful of issues outside of your control. At least you will know why Austin rodent control issues continue to persist. Shelter. Does your yard have a ton of ground cover like ivy etc.? Do you have a huge deck that nothing but a rodent could get access to? Are there trees touching your roofline all around the home? Do you have a Jacuzzi or hot tub that is nice and warm year round. Environmental elements like these will provide access to rodents and they will easily grow accustom the top notch living conditions you are providing. Try and address these issues if at all possible. If you are unable to find any issues you need a professional rodent inspection. A rodent inspection is the first step towards the rodent control Austin customers want. Hearing noises in the attic or seeing a scurrying critter in the back yard can end today.